I love codfish fritters – tasty bite-size morsels of cooked codfish enveloped in light flour – but made them for the first time only last year. 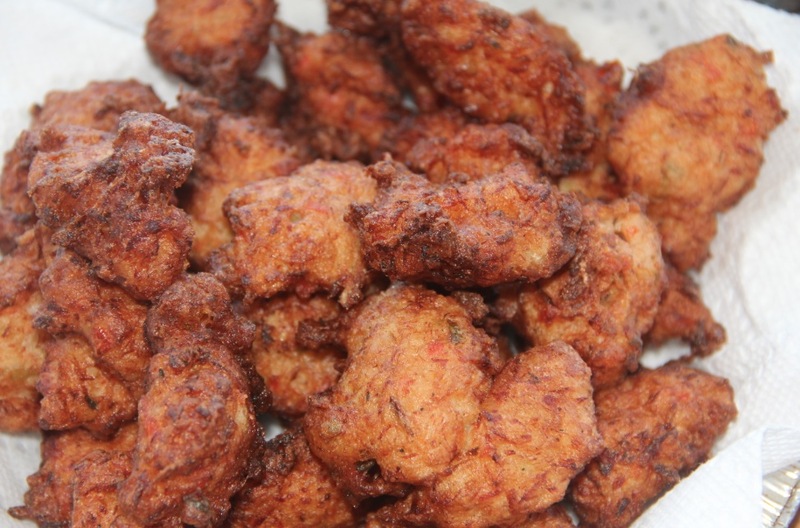 Cod or salt fish fritters are very popular as appetizers or snacks and are made by adding flaked codfish to a batter, which is then deep-fried. Also called Stamp and Go, apparently after the command (“Stamp and go!”) that was given to 17th century British sailors when tasks had to be done in a hurry, codfish fritters are sometimes referred to as Jamaica’s first fast food. They are relatively easy to make, so I’m not sure why it took me so long to make them. Codfish fritters can be eaten by themselves or accompanied by a dipping sauce. Soak codfish overnight in water, or bring to a boil twice (for 12-15 minutes), draining and adding fresh water after each boil. Drain and rinse the codfish under running cold water. Using a fork or your fingers, flake the codfish into small pieces, taking care to remove any remaining bones. Add codfish to the seasonings. Stir to combine. In a medium bowl, add flour and baking powder. Stir to incorporate. Add codfish mixture to the flour and stir to combine. Pour oil into a 6-qt. Dutch oven to a depth of 2″, and heat over medium-high heat until a deep-fry thermometer reads 350°. Using a tablespoon, drop rounds of dough into oil, and fry until golden brown, about 3 minutes; repeat until remaining dough is finished. Using a slotted spoon, transfer fritters to paper towels to drain briefly. 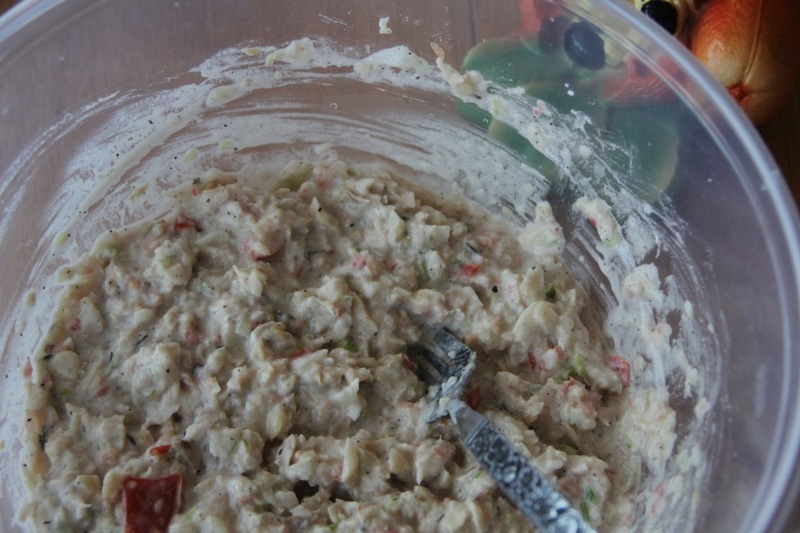 Garnish with tomato or lime wedges, chopped scallion, etc., and serve. Recipe adapted from Enid Donaldson’s The Real Taste of Jamaica. Although I’ve only used codfish, I’m sure other meats can be substituted. Fritters are not only about meat. Bananas that are very ripe can also be used, though the recipe is slightly different. Leave a comment and do the same for the other posts. If you Tweet, G+, Facebook use the hashtag #FoodieTuesday. These look delish! We often use salt cod to make fish cakes, and they are awesome! Thank you for the invite to join Foodie Tuesday. I make vegetable fritters sometimes, which are packed full of whatever vegies I have, grated. But I only shallow fry. Have a great week. I love fritters of any kind! These look yum! Oh another mouth-watering post, Marcia. Those fritters have my name written on them I think. Should I ever be fortunate enough to meet you in person, we will have to share a plate of those wonderful creations. My post today is another that I can assure readers of yours is still a successful enterprise in Central Washington State, we dropped by the cafe just last week. Is it easy to find Scotch bonet peppers in the States? Love cod fritters, this looks so yummy! I make my own version with fresh corn and it’s so good, also do a nice tropical mango relish which works well with the fish. Great recipe! I’m bookmarking this and I’m sure my family will love it. It looks delicious! Thanks Marcia! I’m a big fan of fritters of just about any kind. These look fabulous! Wow, these look scrumptious!!! I wish I were there to eat them with you!!!! Fabulous post and I must try out your recipe soon!! Looks and sounds delicious, Marcia! Must try this with at least some kind of fish. I think they’re the same things, Nancie. I bet they’re delicious! Thanks for linking up, Jill. I’ll try making veggie ones one of these days. Yes, we shallow fry as well but I prefer deep frying because it’s quicker. I do have a recipe for a mango relish that I plan to try the next time I make fritters. I’d also like to try one with fresh corn. That must be so yummy, Noel. Thanks for the relish suggestion. I’m not sure about upstate but I used to find it in the Korean store and the supermarket in Harlem. You could also substitute jalapeno or other type of pepper. You’ve given me something to think about, Jackie. It’s lovely to meet virtually but even better face to face and over a delicious meal. I’m happy to read that that cafe is still packing them in! Wonderful news. Hope you can share a recipe, Sonja. I’ve had them with a mango sauce. There’s also a creamy gingery sauce I had once that was just yum! Wish I could recreate it. You’re welcome, Mary. Hope you get to try it. Thanks, Cathy. They’re really delicious –you can never have just one. They taste scrumptious, Jeff. Hope you get to try them soon. I bet they’d work very well with any kind of fish or even meat, Andrew. These look and sound delicious! I’ll have to try this recipe out. I think I could handle making these. Your pictures are mouthwatering. Hope you do, Jeniffer. The best part is that you can substitute anything – meat, fruits or vegetables. Thanks, Michele. The best part is you can use meat, fish, fruits or vegetables. Hope you get to try it. I would eat these if someone made them for me – and I LOVE banana fritters. They could become an addiction. I’ve saved these to Evernote. They look ever so appetizing. Hope you get to try it one day.